Improving PC Performance with Readyboost? How Is This Possible? 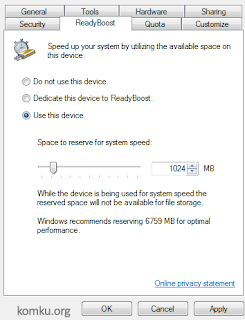 ReadyBoost was first introduced in Windows Vista in 2006 and is still included in Windows 7 and Windows 8. ReadyBoost works in a similar way to Superfecth. Superfecth works by monitoring and then automatically loading the data or program used in the computer into RAM so that the program becomes faster when run. 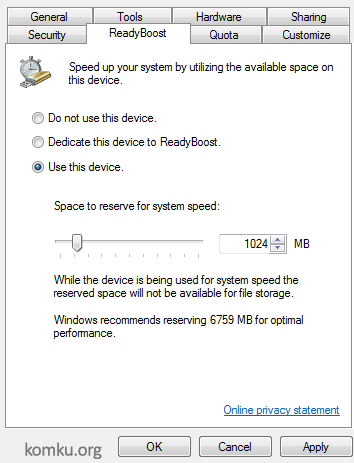 ReadyBoost, on the other hand, does not use RAM but uses a USB flash drive (or other flash based memory) instead. Can ReadyBoost really improve the performance of your PC? In theory it would be faster for a computer to read small data from flash drive than it does from hard drive, but unfortunately the reading speed of flash drive is much slower than that of RAM; therefore, if the capacity of RAM in your computer is sufficiently large---say, more than 1GB, adding flash drive for ReadyBoost would give very little effect and even the performance improvement produced may not be perceived at all because Superfetch has done effectively to foster such improvement. In contrast, if your computer only has a small amount of RAM (512MB for example), then the addition of 1GB or more flash drive memory for ReadyBoost would be very influential, although the increase was not as high as the performance obtained from the addition of RAM with the same amount. When should we use ReadyBoost? As I said before, the improvement of PC performance with ReadyBoost will only be perceived if the capacity of RAM in your computer is small (1GB or less); but you are too lazy to add RAM, ReadyBoost will be very useful. Please note that if you use ReadyBoost, it is better for you to use a high-speed flash drive so the performance improvement produced can really be perceived. If your computer is slow because its RAM is small, do not be too lazy to buy additional RAM and to improve its capacity. ReadyBoost is only viable under a particular circumstance or if you have a high speed flash that you don't use. Is your computer running out of available RAM slots? Then replace your RAM with one with larger capacity. Has the maximum capacity of your computer's RAM been reached? Then upgrade your computer's hard drive with an SSD; your computer's performance will certainly be much better.